It’s no secret Steve and I don’t excel at D.I.Y. projects around the house. 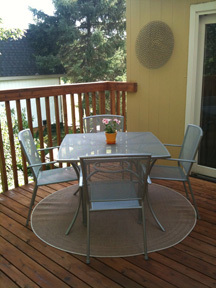 Still, we take pride in our home and want to keep it looking as good as possible so we attempt projects now and then. 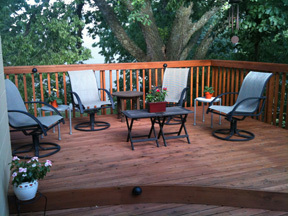 We’ve done mostly painting and small repairs, but the biggest project we’ve attempted to date was re-staining the deck. I mean, refinishing the deck which is what ended up happening. We had a lot of great advice. 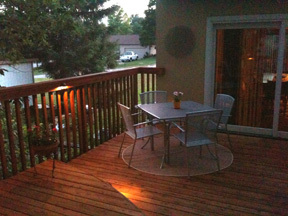 Mom and Burl had done their deck a couple of years ago and Pavel does decks all the time so everyone had tips and tricks for us. We learned that the worst thing you can do to your deck is apply a waterproof sealer which, of course, is what the previous owners did. The sealer bakes in the sun and turns to resin making it impossible to remove unless it starts to flake or you sand it. Power washing will only take you so far in topcoat removal. Steve power washed the deck between rainstorms then used a power sander to get the rest of the crap off. It was a grueling process. 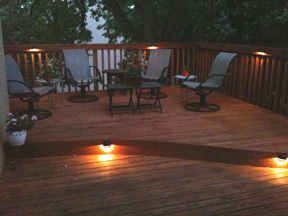 In the meantime, we found a great deal on stain, chose a redwood semi-transparent color and got ready to go. Steve spent a week ago Saturday working on the front deck because he figured he could make mistakes on it and learn the staining process before tackling the back deck, which is where we spend all our time. Pavel had suggested he use a simple 1 gallon weed sprayer to apply then go over it with a brush. It worked well. On Sunday, I took over the tedious task of painting the railing. The entire time it took me to paint what little railing we had on the front, Steve took to sand the rest of the back deck. Whew! This was getting tiring! Fast forward to this past Saturday. Steve had worked throughout the week staining the back deck and had taken some advice from yet another source to get a painter’s mitt to stain the railing. By Sunday morning the deck was stained, railings and all. But wait, there’s more. The finishing touch would be installing low-voltage accent lights around it so we’d have light at night. Naturally, Sunday was blazing hot. I guess that’s better than pouring rain, but not by much. And we decided to install said lights in the middle of the afternoon while it was hottest. We’d purchased the lights earlier in the week, taken them home and hooked them up to see how much light we’d have. Good thing we did because I initially wanted two sets and one is plenty. we mapped out placement so when it was time to install them we knew exactly where they’d go. Steve, being the mastermind that he is, managed to squeeze every inch out of the 50 feet of wire that came with the kit so we didn’t have to buy more. Several hours, and near heatstroke later, we had lights. We put everything back in place, cracked open a beer and took a look around. I mentioned it looked like an ad, in a good way, and Steve agreed. Yep, sometimes we amaze ourselves. If you need us, we’ll be on the deck. Nice! I can’t wait to drink wine on it! It looks fantastic! Well done you!